It’s a good day when you find a solid gift card sitting in your side purse pocket. You know what I did with that card? I finally bought my damn self a Paderno spiralizer. I’ve had my eye on it for some time, and since spiralizing seems to be taking the health food world by storm, the time had come to invest in my cooking future. This tool is impressive. It comes with three types of blades – thin noodles, thick noodles, and ribbon style – and suction cups to hold it in place. Unfortunately for me, none of my cooking surfaces permit easy suction, but there is a cool handle bar to assist the spiralizing process. First, you place a vegetable along a scorer, secure the back end with prongs, then churn out noodles with a fury. You’ll want to score the vegetable prior to securing to make shorter noodles or you’ll have a single noodle for days. 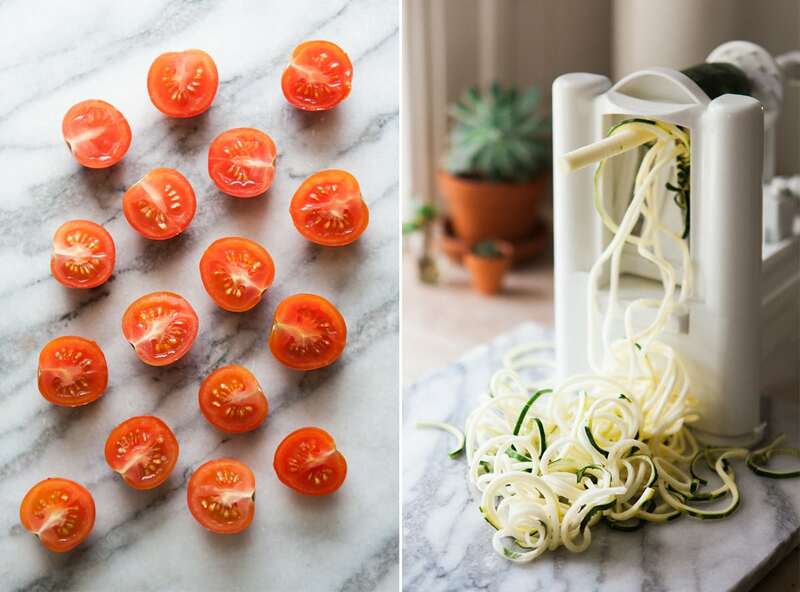 Zucchini noodles: would they match up to pasta? Insert wide-eyed emoji. Oh wait, 😳. Well, they did. Total A++. Not only was this recipe delicious, it’s a thirty-minute meal from start to finish. 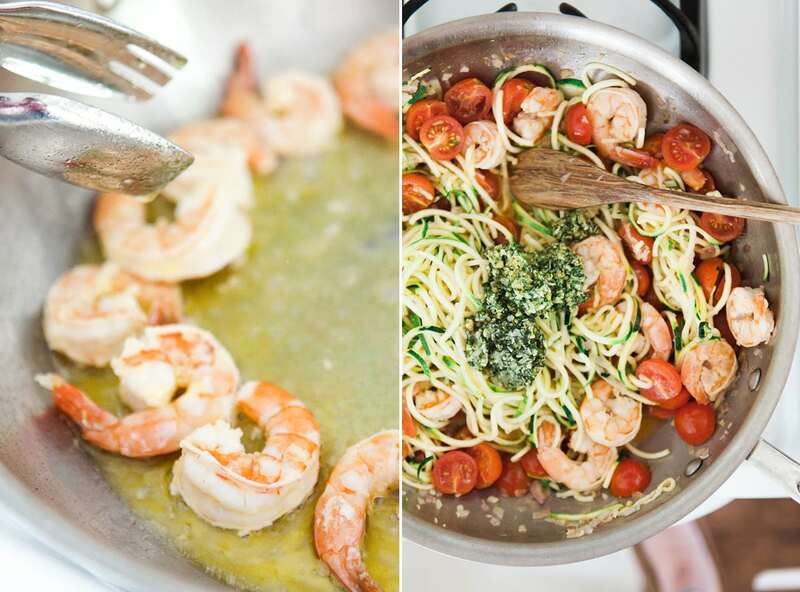 The refreshing acidity from the lemon-garlic shrimp marinade, paired with the texture and crunch of the noodles, topped with homemade pesto made by hand, and the richness of parmesan … Oh mah gawd, pretty sure this is what heaven is made of. I believe you could impress any Italian with these noodles; they really hold their own. Spiralizer, you put your money where my mouth is. No. 1: Take your cleaned shrimp, rinse, pat dry with a paper towel, and place in a bowl. Add olive oil, garlic cloves, lemon juice, lemon zest, white pepper and salt. Let marinate for a minimum of 20 minutes. No. 2: In a large sauté pan, heat olive oil on medium heat. Saute shrimp for two minutes on each side. Add shallots and cook until translucent. 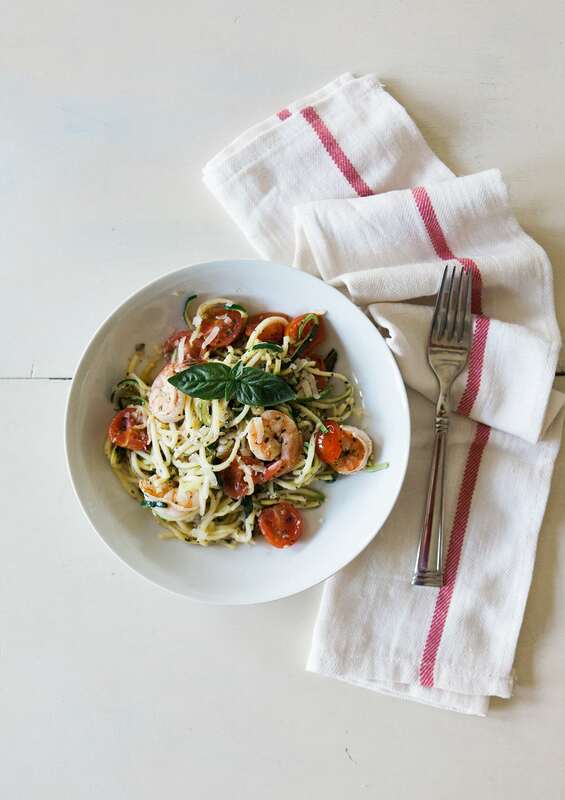 Add cherry tomatoes, cook for a minute, then add spiralized zucchini. Cook until noodles start to wilt down, about 3 to 5 minutes. No. 3: Turning off heat, add pesto and torn basil leaves to the pan and stir. Dish out zucchini noodles, top with parmesan, garnish with basil leaves, and serve immediately.